Eric Capolino | Military Moms Need This! Mommin’ is hard. And living away from home as a military spouse can make it even harder. 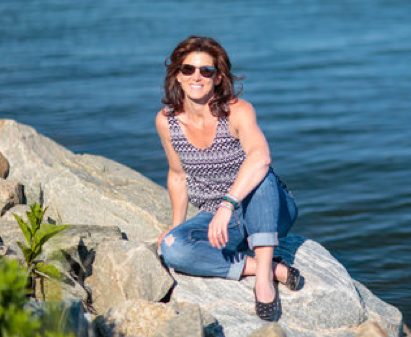 But Kamlyn, a military spouse currently stationed in Italy, has been able to make new friends, explore new areas and become healthier just by taking regular walks with 99 Walks. And so can you. The secret? Walking with a supportive team of women like you who have your back and finding just 30 minutes every day (okay, most days), to move your body, feel the sun on your face and see the local community in a whole new light. And when you do, not only will you feel better, you’ll earn your own reward — we call it “wearable inspiration” — a bracelet that will remind you of the goal you crushed. 99 Walks members never walk alone, even if they are on their own. Our always positive, super supportive Facebook group is there for you, and you will be invited to daily Community Walks and have the chance to take inspiring guided walking classes. You can join a team of three and walk in person, or virtually as you chat on the phone while you rack up the miles. You’ll feel better as you become more active. And you know what? You’ll be a better mom, partner and person for it. It’s a win-win. Here’s how to get started. 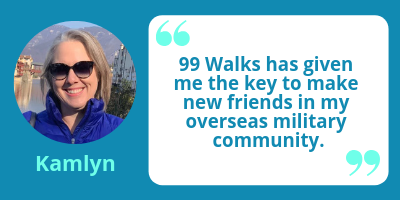 Sign up for the 99 Walks Challenge, either for April or for three months (like Kamyln). You’ll walk 33 miles a month (just over a mile a day), connect with friends old and new and earn your bracelet. Hundreds of other Macaroni Kid readers have discovered how powerful walking is and have seen real changes already. And as a Macaroni Kid subscriber, you can save 10% with the code LETSWALK. Don’t miss out! We limit the number of members to keep it personal and be sure we can support everyone. April will pass, May will pass … do you want to be in the same place? Or do you want to take steps to a better you? Join us as we continue to build a movement, empowering moms like you!